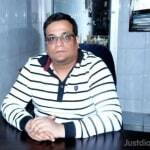 Dr. Gaurav Mishra is an experienced Ophthalmologist in Defence Colony, Meerut. He has been a successful Ophthalmologist for the last 21 years. He is a MS - Ophthalmology. He is currently associated with Drishti Eye Foundation in Defence Colony, Meerut. Save your time and book an appointment online with Dr. Gaurav Mishra on Lybrate.com. Lybrate.com has a nexus of the most experienced Ophthalmologists in India. You will find Ophthalmologists with more than 39 years of experience on Lybrate.com. You can find Ophthalmologists online in Meerut and from across India. View the profile of medical specialists and their reviews from other patients to make an informed decision. I'm suffering from Eye sight My sight is +5.0 I'm wearing eye classes it's difficult to maintain I want to improve my sight and get rid of glasses what should I do. I am getting red eyes at night after I surf my phone about any hour. I cannot stay away from phone so guide me in this matter. I am 20 year old and l suffer from my eyes number it so much 3. please tell me about this to reduce the eye number. Lasik is a simple laser procedure which changes the shape of the cornea so that the light rays fall on the retina properly. It is a painless procedure. It is a day care procedure does not require any injections, does not require admission, you can simply resume your duties in 2 days. Cost varies from centre to centre. Side effects are usually limited to dryness of eyes for few months. We can do lasik anytime after age of 18 years. You need to undergo proper prelasik checkup to decide whether lasik is safe for you or not. I have allergies and my eyes are effected the most they are red and itchy, what should I do? Changing season causes this red eye and allergy problem so please protective glasses when you go out. Wash your eyes with drinking cold water once you are back home. Sir, I am having trouble with my eyes. My eyelids are getting swollen very frequently at nights during winter. And I feel dryness beneath my eyelids. It creates an itching sensation. Please help me to understand what it can be and what medication should I take. Also I wear glasses and sometimes use contact lenses. Your help is Highly appreciated. Thanks a lot. My eye power is -9.5 in both eyes. I am almost 26 now. It is still increasing. It seems I inherited it from my father whose eye power is -7.5. I am scared that I may lose my eyesight if it continues likes this. I am a software engineer. Please advice. Hi, You have high myopia. I would advise you to get regular eye check up and complete retinal evaluation take good care of your eyes, loke good sleep, lot of fruits and vegetables. Avoid gadget se as much as possible. I use power glasses of power 8, and I want to get rid of that. Is there any operations for it. So I get a normal vision. please help as it is needed. I have to work alot of hours on my laptop, at the end of day I have alot of pain in my my, I checked my eyesight its okay, what can I do to save my eyes? There is no such thing as computer glasses as such. Some people who have a minimal refractive error will often get away without wearing glasses, but when working on a computer screen or doing a lot of concentrated work, the small prescription can begin to cause symptoms and under these circumstances correcting the prescription with glasses can be helpful. An anti-reflection coating (Ultraclear) is often advised to reduce the annoying reflections of light from the lens surfaces. If your eyes are fine and normal then there is no proven glasses that can be prescribed to help. However, some people find that wearing glasses with a tint that absorbs the blue spectrum of light makes vision more comfortable. They are usually tinted a yellow colour. A common problem when working on a screen for long periods is 'dry eye'. This is because concentrated work tends to reduce the blink reflex that replenishes the tears, and the dry atmosphere and lack of fresh air adds to the problem of insufficent tears. Allowing the cornea to become dry can cause irritation and blurred and variable vision. Use some lubricating eye drops like refresh tearsthat use them at least 4 times a day at least. You do need to look at every aspect of your work environment also. Use proper lighting , dont work in dim conditions Should use table and chair . Your table should be of proper height so that you dont have to bend too much. Take rest after 30 mins for few mins ,put the tear drops and work again. Do blink intermittently. Hii I am 25 year old guy I am wear specs which has -2.5 points I am quite worried about my eye health as I am job gives lots of exposure to sun and pollution is there any drop or any medication to make my eyes stress free and keep it healthy. And I have dark circles around my eyes. I am vegetarian I don't smoke and non alcoholic but I have a troubled sleeping. Is there a way to correct vision other than lasik surgery or wearing spectacle who is suffering from myopia.